Google Glass has a bright future ahead if these newly discovered features in this month's XE10 update are any indication. 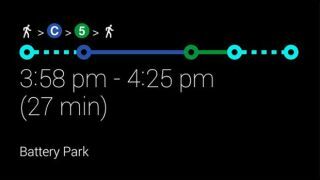 And we're not just talking about the freshly added mass transit directions Google announced earlier last week. After finding Google's announcement rather light, the code crackers at Android Police dug into the latest monthly update for Google Glass. To their surprise they found a number of new features, the most interesting of which includes double blink detection-related files buried in the Gaze folder. There aren't many hard details on what you could possibly be double blinking at but we imagine it might be used in the same way as double-clicking your mouse. To jog your memory, Gaze has been the catch-all folder for any possible hints of eye-controlled Glass applications. Previously, hackers found code in the same place hinting at a wink-controlled camera. Besides hints at double blinking controls, there was also a laundry list of additional features that could potentially be activated in the next version of Glass' software - notably taking a panorama pic, playing music, or starting a game of golf. Oddly enough Google slipped in some overly demanding features like creating a 3D model, translating a phrase and even tuning an instrument. This could suggest that either the future consumer version of Glass will have more power tucked into it, or all extras require a Google Now connection to process the data. Meanwhile, the potential ability to call a car might be something that could actually be usable, especially with Google Ventures recent investment of nearly $258 million (about £151m or AU$270m) into Uber's piggy bank. Google Glass isn't even out, but already Glass 2 is in the works.